A few weeks ago something was said to me that I will never, ever forget. Three simple words: "I CAN RELATE" will forever be etched in my mind. In one of the collaborative classes that I teach in, I have been impressed by a student from very early on. I have not noticed her for the super cute side pony she frequently rocks or her academics (although she is very bright), but for the way she treats one of "my kids". As most of the students in the class are annoyed or bothered by his interruptions or quirky habits, she sits next to him and treats him like he is "normal" and will go as far to ask him to partner up and read their novel or offer him pencil lead or paper when he needs it... which is most days. She doesn't use a lot of words with him, but her compassion probably says way more than anything she could ever say. I went home yesterday thinking of her and wondering why...why is she so nice to him? Why does she care? Why aren't other students more compassionate towards him? Today I received an answer to my why questions. I walked up to this student with extreme compassion and handed her a "gotcha" (a form that allows us to give out positive consequences to our students when we catch them doing something great). I told her that I have noticed how she treats this student in class and it has really impacted me...before I could even ask her WHY, she said to me, "I can relate, I was on an IEP until last year so I understand what students like him go through everyday." Tiffany, I am the Alpha and the Omega. I see it all. I know Jack's needs and I know yours as his mom. Jack is my child and I will provide him with everything he needs. Continue to rest in my love for Jack. So, as I continue to trust that the Lord is taking care of Jack, I thank him for students like mine who have encouraged me and allowed me to see this extreme compassion we're all called to convey to others. that there should be no division in the body, but that the members should have the same care for one another. And if one member suffers, all the members suffer with it; if one member is honored, all the members rejoice with it. Jack walking up to the register to pay for his new shin pads for soccer! I am writing today (after taking a few months off-where does the time go??) to ask you for a favor of sorts. Let me give you some background first. In May I took a Special Ed teaching position at Will Rogers Middle School in Miami, OK for the 2013-14 school year. I have always had a heart for those who need a little (or a lot of) extra help, but since I have had Jack, it's turned into a passion of mine. I see these kids as "my kids"...maybe even more than before because I can so closely relate to what they go through everyday. I see their triumphs and victories after gaining a concept they have worked on over and over... and I also see their pain that occurs day in and day out when I look into their tear-filled eyes. It's all I can do to not join them and allow my tear-filled eyes to turn into alligator tears streaming down my face. You might be wondering where you fit into this picture. Here's the favor I need from you-from every parent out there. PLEASE, PLEASE, PLEASE talk to your kids about those with special needs. It might not seem like a big deal or something you need to do...but, it really is. We so strongly believe that communication is one of the biggest keys to true acceptance. Start the conversation off with something like this and see where it leads. 1. Ask them to refrain from using the "R-Word". Or, tech-tard or any other form of "tard" out there. You'd be surprised how hurtful this is to our kids and how often it's used. 2. Ask them if they know any kids with special needs from school. If so, ask them to walk by this student and simply say "hello." It's amazing what a simple greeting can do for our kids' confidence. 3. Provide them with answers to questions they might have about kids who go to the resource room for extra help. Explain that these students might just need a quiet environment, or more one on one help...it's not because they are "dumb" or "stupid". 4. Ask them if they would be bold enough to defend a kid with special needs who is bullied. Teachers see lots of things, but not everything. We need others to be brave and stand up for our kids too! Thanks in advance for joining us in our mission to educate, unify, and foster acceptance! Well, now, is the time to get 'em! From Monday, April 29th at 10:00 pm until Tuesday, April 30th until 10:00 pm we are offering a HUGE special...2 TEES FOR $20 (+shipping if we have to ship yours)!! Email us at: sales@thecommonthreads.org to get yours--first come, first served. We will notify you via email if we do not have the size and/or color you would like asap. And, we will update the blog with accurate information frequently. Thanks!! A few weeks ago, I was reminded by my MIL and FIL to pray the "impossible prayers" more. Pray for those things in my life that I have absolutely no control over, the things that ONLY God can do. Continue to pray the prayers that I have prayed for years with "no result". Sometimes (or a lot of the time) I pray for the things that seem very possible to me because I can contribute to the outcome...but, in those prayers of complete and utter dependence on Him, something special happens. There's something so powerful about totally releasing a stronghold, person, or circumstance to The One who knows the beginning and the end. The One who knows how many hairs are on the head of the person I am praying for. The One who is in every detail of every circumstance I face. The Word is full of so many scriptures that inform us that God is able, so why don't we (I) go to His throne more with these impossible prayers? The Lord was so incredibly gracious to allow me to see two miracles just days after bathing in these truths. The stuff ONLY He can do is still taking my breath away today as I write about it. Jesus said, "With man it is impossible, but not with God. Andrew and I just put the boys down for the night and were getting ready for bed ourselves. We had just replaced our stolen iPad with a iPad mini over the weekend and we were playing around with it. Andrew was asking Siri what to wear the next day because our weather had been anywhere from 40 to 75 that week...gotta love Oklahoma weather! Anyway, right after he spoke the words "What should I wear tomorrow? ", our notes from our original iPad showed up on the screen of the iPad mini. You might be thinking, "huh?!" or "what?!" right about now. Trust me, that's exactly what we were thinking too. Andrew immediately emailed the documents to me and as I looked everything over, it was all there. Most of the notes from my book, my journal entries, Jack's progress notes that I have taken since his diagnosis, etc. We just looked at each other and didn't know what to say...but, we both knew it was a miracle. It was something ONLY God could have done. We were not backed up to iCloud. We didn't even know what iCloud was before all of this happened (shocking, I know.) And, yet, there it was, right in front of our eyes. Simply amazing! About a week after we got the notes back, we had the opportunity to see another sweet miracle. I decided to take Jack's cane to school to see if he would attempt to use it again instead of his K-Walker. We tried to get him to use in January and he wasn't too fond of it-it was used more as a sword with Will than anything else :) When we picked him up that day, he had not tried the cane yet, so we decided to give it a shot on the way out of school. As soon as I put the cane in front of him, he grabbed it and just took off towards the door! It was as if a light-bulb went off at that moment and he felt confident that if he needed the cane, it was there to help him. We all stood there amazed, grinning ear to ear. And again, we knew it was the Lord doing what ONLY He can do. So many of you know that this has been a prayer of mine since Jack was diagnosed at 9 months old. He will be 4 years old in July and Andrew and I have prayed so many "impossible prayers" over his life the last 3 years...we are thankful to the Lord for giving us hope and for allowing us to see Him at work! My prayer for anyone reading this is for you to be encouraged to pray the "impossible" with me. Pray for that job you so desire. Pray for your marriage to be strong in the Lord. Pray for your child to say "momma", to take a first step, to make a new friend. Pray for your loved one to follow Jesus. Pray for deep relationships with others. Pray to forgive the unforgivable. Pray to give up a stronghold in your life. Pray for complete healing-- emotional or physical. Our God is able. Our God is stronger. God you are higher than any other. What a precious gift to have this video of Jack and the two doctors who have been so helpful to our family the last 3 years. Thank you, Shriners Hospital for Children in Shreveport, LA and The Children's Center in Bethany, OK for all you do! You give families hope and somehow make us feel "normal" as soon as we walk in your door. May God continue to bless the work of your hands! Meet Ian Winfrey. Ian is a a sweet 8 year old who lives in Grove. His parents are Susan and Rod Winfrey and he has 2 sisters, Madison and Chloe. Ian was born with a neurological condition called Angelman Syndrome which is a deletion in his maternal 15th chromosome. Some characteristics of Angelman Syndrome may include a stiff jerky gait, developmental delay; absent speech; seizures, fascination of water, and a super happy/ excitable demeanor. Despite Ian's diagnosis, he is one happy, loving, laid back, beautiful boy who makes everyone he comes in contact with, smile. He teaches us all to enjoy the small things in life, smile at the beauty around us, and laugh even in the midst of trials. He is now 8 years old and is currently in a wheel chair, however, a lot of "angels" walk and Ian is showing much progress in taking many assisted steps. He currently attends Grove Lower elementary and has a wonderful team of teachers, aides, speech, occupational, and physical therapists that help Ian progress daily. 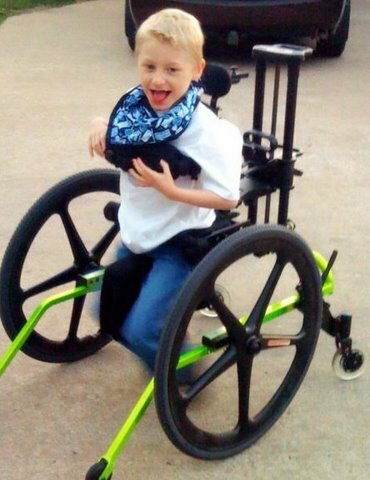 Ian also receives extra therapy at home by a local pediatric PT twice a week and by his family. 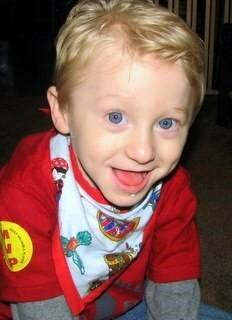 Ian and his family will be attending the Dallas Angelman Syndrome Walk this year May 18th. Will you please help by supporting this cute little guy? Angelman Syndrome Foundation hosted 30 walks in 30 cities across country to raise awareness, funds to find a cure for Angelman syndrome. More than 10,000 supporters attended and raised approximately $1,030,000 to date! Not only is investment in AS research expected to help those living with and affected by AS, but other conditions that share related symptoms such as autism, epilepsy, Rett Syndrome, Prader-Willi Syndrome and even forms of cancer. By investing in AS research, we have the potential to positively impact the lives of more than 12 million people worldwide. Since 1996, the ASF has funded over 66 research grants totaling over $4.6 million. The most aggressive funding of research is aimed at finding therapies and treatments for curing certain AS symptoms. Thanks for sharing your amazing son with us, Susan! Also, Ian's mom is the founder and creator of Hipperbibs(www.hipperbib.com). Please check out her website and see if it might be something your child needs...there are so many great designs and they are very durable! 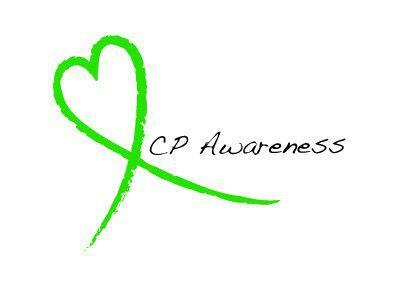 Today, March 25th, 2013 is designated National Cerebral Palsy Awareness Day by the US Congress. We are so thankful to those who have worked so hard to make this happen. You might be wondering, how can I raise awareness? What is it that I can do to help? You might be surprised how easy it really is. I can't tell you how much encouragement we have received from conversations that have taken place because of a t-shirt. Talking about, educating, fostering acceptance...these are all things we are about at Common Threads and we pray that you will join us in our mission to spread awareness. So, we are wearing some GREEN today or a Common Threads tee...or both! Will you join us? Then, post your pics to our Common Threads FB Page @common threads, on Twitter @common_threads1 or Instagram @thecommonthreads (#cpawareness)? 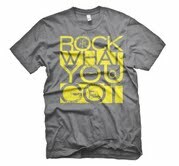 If you do, you will be entered into a drawing to win a FREE Walk by Faith or ROCK WHAT YOU GOT tee!! Today, we honor our son, Jack and the thousands affected by Cerebral Palsy. You are our heroes and we are blessed because of you; your joy, perseverance, and unconditional love have taught us so much. May you always know how much you are loved right back.